What’s driving future glass trends? Transparency, performance and technology, according to Lisa Rammig, senior associate for Eckersley O’Callaghan. Rammig spoke Jan. 23 during the 2019 National Glass Association Annual Conference in Naples, Florida. To meet next-generation demands, players from across the industry—from universities to façade engineering firms to glass fabricators, and more—are pushing the envelope of what’s possible with glass, developing everything from ultra-thin glasses to transparent sealants, and 3D-printed glass to oversized and curved lites, says Rammig. The Eckersley O’Callaghan team has been instrumental in redefining the capabilities of glass. The firm, led by James O’Callaghan, has been a key player in the development of the all-glass facades and staircases found in Apple stores around the world. “Our work with Apple amounts to the idea of creating transparent structures. … The latest generation [of Apple projects] achieves a new generation of transparency,” Rammig says. In several of the new Apple locations, the roof rests on just the glass, or on the glass and minimal column supports. “The glass completely disappears,” she says. Key to the firm’s exploration of the possibilities of glass has been its work in non-commercial, research-based environments, including its participation in the glass technology live innovative exhibition at glasstec, held every other year in Düsseldorf, Germany. The exhibition, organized by four European universities, provides a venue for student designers, university teams, design firms and industry companies to explore next-generation glass solutions. For the 2018 glass technology live expo, Rammig and the Eckersley O’Callaghan team developed an all-glass seesaw made of 11 layers of 2-foot-wide glass, laminated together and pivoting on a transparent acrylic rod. The seesaw was a follow-up to the team’s stand-out all-glass slide, developed with glass fabricator Cricursa, which was a centerpiece of the 2016 glass technology live exhibition. Rammig noted other impressive glass displays from the 2018 glass technology live—thin glass, large curved glass installations, switchable displays, multi-layered laminates, 3D-printed glasses and more. The installations demonstrate what the industry can do today and where it's headed. “Glass is becoming a medium that doesn’t just form the envelope or shelter,” Rammig says. The material can be a building support structure, a medium for communication and technological interaction, or an integrated smart system for whole-building performance. “It is amazing to work with this material,” she says. Katy Devlin is editor in chief of Glass Magazine. Contact her at kdevlin@glass.org. Follow Glass Magazine on Twitter. The latest Architectural Billings Index came out and I was almost correct with my prediction of it being underwater this month. The ABI came in at 50.4, which is barely beating the break-even 50 mark. I knew softening was coming, just not as much as I thought. The analysts pointed to the tariff issue, the U.S. government shutdown, and a feel for an unstable business landscape as reasons why. Now the watch continues into next month. The overall attitude in the field has been on the positive end, but there is a bit of malaise to start the year. There was solid news in that the project inquiry number stayed robust at 55, so that is good. In any case, I am not at all surprised about the main number, but I am pleased to be wrong in this case. No matter how small the margin is on the plus side, I am glad to take it! By the way, with regards all the forecasts coming in; AIA’s “consensus” forecast for 2019 nonresidential construction is a 4.4 percent gain. For many that is not impressive or meaty enough, but for me I can’t see how you could complain about positive growth. "Despite dropping jaws with transparent IGU’s, flexible thin glass vent windows, 3D printed shading integrated directly into an IG unit, and a freaking all-glass slide (!!!)... she claims 'we’re not where we want to be.' Fantastic presentation!" I surely hated missing it. Have you noticed there’s a lot of airport remodeling/rebuilding going on? The nice thing is the amount of glass being used is awesome. Last week the drawings for the update to O’Hare in Chicago came out and they all look to really want to take full advantage of the greatness of the glazing! Scary story about construction cranes being hacked. That will be one of the worries with how connected our world is these days, and will be even more connected in the future. I ran across some interesting numbers last week with regards to website effectiveness. Eighty-four percent of industry/architectural buyers will check out a company’s website before doing business with them. So, when I am on here complimenting folks on their new sites, that is a big reason why. It matters. That said, kudos to Heather Monroe at Machines and Wheels on the re-launch of their site. Tremendous work—site is smartly done and easy to navigate. Great work to Heather and her team! Last this week: back to the Annual Conference and the news that Julie Schimmelpenningh was named as the 2018 winner of the C. Gregory Carney Member of the Year Award. Julie is flat out awesome. She deserves the recognition and I am thrilled she was honored with this amazing award. Also knowing that our friend, the late Mr. Carney, would be so pleased that Julie was selected makes the day for me. Congrats Julie! Time for my fearless predictions for 2019! 1. I may as well get this one out of the way early: security glass will continue to grow in 2019. Yes, it’s on my list every year but I am still convinced additional growth is on the horizon. School security is a priority like never before. More and more private businesses are upgrading and government and municipal are pretty much locked in with desires to go heavier on security. 2. Look at lifting. The days of glaziers trying to use old-fashioned muscle to install and move glass are dying. The days of installers having to share various equipment to glaze are also coming to an end. Like never before, lifting apparatus is everywhere and it has advanced amazingly over the years. Just visit GlassBuild America and be in awe. I am a big fan of this sector and its importance to our industry. 3. Speaking of important, the robot revolution is here. I predict the usage of robots and automation at the fabricator level will jump quite a bit as the year ends and many fabricators will enter 2020 with a new look and approach to production. Included is this are terms like IoT and Internet 4.0. Get ready: innovation is coming fast and furious. 4. Deals are not done. Many companies who are thinking about selling are staring into the future and thinking “this needs to be the year I sell” because we really don’t know what 2020 is going to bring from an economic side. I see a bunch of smaller deals, but we’ve got a doozy or two coming our way and the rumors are absolutely wild. 5. Talent on the move. I think there’s a ton of talent in our industry and I have a feeling that we are going to see some of the best folks we have transitioning either into promotions at their current company or moving on to new ones. Any business owner who’s looking to take a leading position going forward has to be looking at making a run at some of the talent out there. We will see how these come out. I am always curious on what my dear readers think so feel free to reach out to me and share! Would love to have the conversation! One of my favorite things each year is when it’s announced that the employees of Viracon donated a huge sum to charity. Once again, they’ve blown me away. It was announced last week that the incredible team there donated $116,000 to the United Way. Kudos to everyone at Viracon and special props to Carla Kern who heads this effort every year. Awesome stuff! The deal on the Project Managers Reference Manual for members of National Glass Association is an absolute steal. Must buy. And if you are not a member of NGA, you should join to take advantage of things like this! Click here for more info. Additional note on project managers: I am honored to head up a panel at BEC in March on the training of project managers. We have two incredible industry brains on the panel in Brian Fillipiak of Alliance Glazing and Paul Robinson of Pioneer Glazing, as well as Neil Opfer, a professor in the construction school at the University of Nevada Las Vegas. All I can say is in my initial talks with these guys, it’s been an incredible learning experience of their best practices and ideas to keep improving our world. I think I may just moderate by introducing them and then sitting back and watching them go. Get registered for BEC today! Last this week: for those of you going to the Annual Conference, I sincerely hope to see you there. My schedule is pretty messy so I may not be there for long or at all depending on how things break. I am bummed because this will be one the best conferences ever. Enjoy, and I look forward to hearing about all of the details. On Oct. 8, the Intergovernmental Panel on Climate Change published its Special Report on Global Warming. According to the report, limiting global warming would require “rapid and far-reaching” transitions in land, energy, industry, buildings, transport and cities. Ever since the publication of the report, the discussion has been actively laying out different paths to solve climate change topics debating which sectors should contribute the most. The answer is quite clear: all sectors must contribute. However, some sectors consume more energy and omit more carbon dioxide than others. Glass windows are estimated to be responsible for almost 25 percent of heating needs in the European Union and for almost 10 percent of cooling needs. Upfront it looks like glass is a big part of the problem, and when looking at the numbers one would probably claim it is today. However, given new intelligent glass technologies currently being developed, glass has much higher potential as a solution to the energy efficiency and global warming problems we face today. Emerging glass technologies and value-adding glass products, such as smart glass, are making a strong entry into the market. Smart glass has the ability to control the amount of heat and light passing through the window and thereby significantly reduce energy consumption. However, the issue is not just about how windows keep the heat inside or outside. Smart glass can convert sunshine into energy. Needless to say, that partially or completely energy self-sufficient buildings would play a powerful role in improving the energy efficiency of the sector. As a result, the potential for smart glass is big and the glass market is expected to see double digit growth during the coming years. Smart glass is not the only new application within the glass industry being developed as an answer to current energy consumption and efficiency issues. As the technology leader within the glass processing industry, Glaston’s aim is to be the industry developer and accelerator for emerging technologies. By doing so the company combines commercial targets with societal needs. At the beginning of 2017, the Glaston Emerging Technologies unit was established. The unit provides consulting and engineering services for smart glass and energy glass window production as well as solar energy applications. The unit also sells and delivers the required production lines. Potential areas are solar energy solutions, smart glass and various aviation and automotive industry products. Currently Glaston is engaged in discussions with several companies on the development and practical application of new glass technologies. Typically, these are pioneering companies in their own fields, operating in the global market. Through its technological expertise and extensive contact network, Glaston has in a short space of time achieved the status of a proactive, reliable partner for companies developing and commercializing smart glass inventions. Joséphine Mickwitz is VP, IR, Communications and Marketing, Glaston Corporation. I believe it was tough, but was it a bigger challenge and did the Department of Transportation rules change anything? I am not sure. I know it’s a constant battle, but I’m not sure it cratered the way I thought. I felt that sophisticated glazing would be in style, and in 2018 it was. No matter how challenging the project, it could be done and there were multiple avenues to get it done. I had this prediction in 2017. I had it in 2018. Believe me, I am putting it on the list next week for 2019. It was a better year for security glass, especially in the school segment. Sadly, the need is there. I thought we’d have some exits along with new players. No exits, but plenty of new and aggressive PE’s are on the scene now. Half-right here. The merge formalized, and slowly, but surely the unified voice is really finding its footing. This was a massive undertaking and I am still extremely confident that it’s going to be a great thing. So far, so good; with streamlined efforts in place, this will only continue to evolve and improve. I was not too far off, overall. Better than my pick for the Super Bowl this year, the Carolina Panthers. Oops. Anyway, next week we’ll have my predictions for 2019. I had a lot of reaction to my overall economic look for this year and into 2020. Most of the reaction was that the positive indicators are outweighing the negative. That was very good to hear. We’ll keep on it. Still, I think we’re going to see a dip in the next ABI and I’ll be curious to see if a trend develops. NGA Annual Conference is coming up fast! Have you looked at it or made arrangements yet? The keynote speech by Lisa Rammig is an absolute must-see. Staying ahead of codes, guidelines, and the technical movements in our world is crucial too. Click here to register. I came across an older article about trends in smart hotels; there’s some specific areas that affect our world, specifically the modular building, which I have noted many times. It will be fascinating to see how that and some of these other trends take off. Last this week, this story on the pay comparison between being an architect and managing a fast food joint was noteworthy. I am sure many in the architectural profession were not happy with the comparison, as they believe themselves to be beyond fast food management. Still it also shows that it’s a competitive world out there for talent and some jobs do pay quite a bit more than you think. Construction may be going bionic. 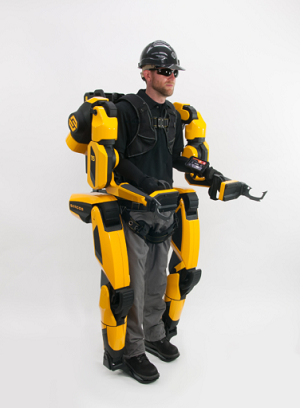 Sarcos Robotics, a global technology firm that designs robotic systems, announced in November 2018 that the company developed a" full-body, powered industrial exoskeleton robotic system," the Guardian XO Max, according to a company release. The technology, the product of a nearly two-decade R&D process, allows the user to lift up to 200 pounds and is slated to be available in 2020. “The potential for full-body, powered exoskeleton technology is immense—from giving our workers super-human strength without putting added strain on their bodies, to improving productivity and efficiency,” says John Santagate, research director, IDC, a market intelligence firm. according to Sarcos Robotics, the manufacturer. Sarcos Robotics' innovation, designed for the industrial market, has clear implications for all construction and building industries, and specifically for workers on the jobsite. And survey responses from the Commercial Construction Index, compiled by the USG Corp. and the U.S. Chamber of Commerce, suggest that construction contractors are ready to invest in these new technologies. The Q4 2018 report of the CCI, released in December 2018, showed that 74 percent of construction contractors surveyed expect to adopt new technologies, including wearable technology, over the next three years. According to the CCI, most contractors—83 percent—see wearable technology as a way to improve worker safety. Improved workforce management and productivity were other perceived advantages.